Successfully Added Huawei Mate 9 Android Smartphone - Android 7.0, Leica Dual-Camera, Octa-Core CPU, 4GB RAM, 5.9-Inch Display, OTG (Black) to your Shopping Cart. Take your mobile experience to entirely new heights with the Huawei Mate 9 Android smartphone. This flagship Android phone from Huawei packs the latest hardware and software alike, delivering a truly amazing user experience. On its 5.9-inch IPS display you will be able to enjoy vivid color and great detail in stunning 1080p resolution – letting you enjoy your games, movies, and media like never before. Along with its Android 7.0 operating system, a smooth and powerful performance is guaranteed. 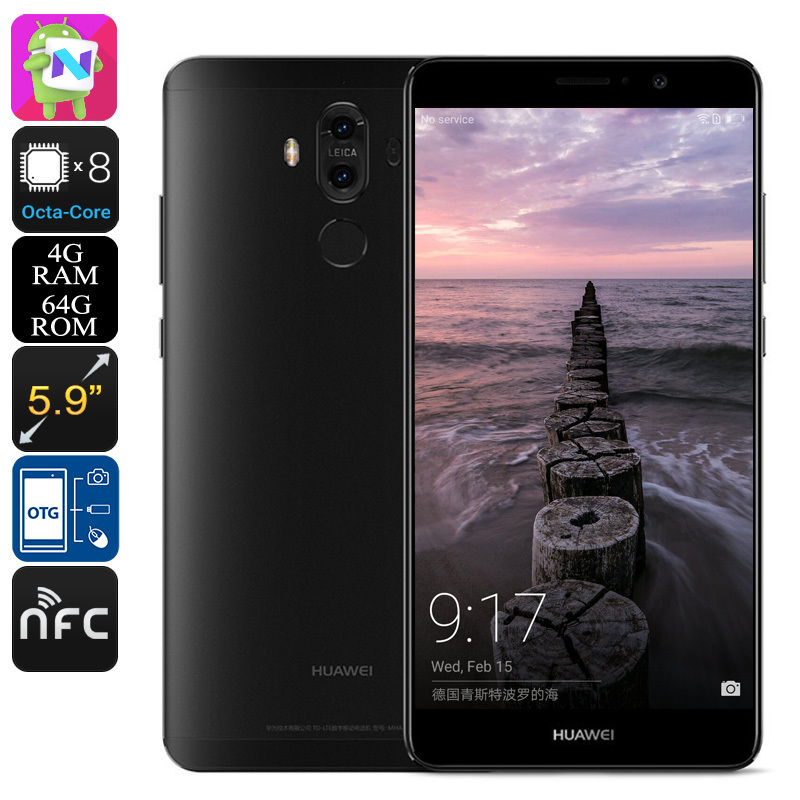 Enjoy the latest applications along with the best features the mobile industry has to – whether you’re into gaming, movies, or simply like to browse the web, the Huawei Mate 9 is there to meet your demands. As a Dual-SIM smartphone that features two IMEI numbers, this latest Android phone truly takes your connectivity to the next level. By allowing you to be reachable on two phone numbers while using merely one device, this Android phone is the perfect device for separating work and private life. Additionally, this Huawei phone supports 4G connectivity that provides you with the fastest mobile data speeds out there, no matter where you’re at. Packing an absolutely breathtaking 20MP dual-lens Leica camera, this Android phone truly sets itself apart from the competition. Taking mobile photography to entirely new heights, this stunning camera lets you snap pictures and shoot footage like never before. Whether you’re simply enjoying a night out with your friends at a bar, or traveling abroad during one of your upcoming road trips – with this professional-grade camera at your disposal, not a single special moment in life will ever again pass by uncaptured. With 64GB or internal storage and an additional 246GB external memory support, you can be sure that there’ll always be some space left for you to store all your latest pictures, video’s, and more. With its Octa-Core CPU that has been clocked at 2.4GHz, this powerful smartphone handles whatever you throw at it with ease. Full-HD movies, the latest games, or the most demanding applications – there is nothing that will slow this beauty down. 4GB of RAM further increases the phone’s power, allowing you to engage in multitasking sessions and enjoy numerous of its features at the same time. Thanks to its 4000mAh battery, this Chinese smartphone delivers up to 5 hours of continuous usage time – enough to get through the average day of smartphone usage without needing to worry about running out of juice.